Are you ready to spin me right round, baby right round? It's almost time to grab some vinyl, scratch, cross fade, and glow stick the night away. Both Gamestop and Amazon have listed the prices for the upcoming DJ Hero game with the accompanying turn table. Seems a bit high for a single instrument title if you ask me. It'll make finding a co-op partner that much harder as well, I think a lot of people are going to be reluctant to pick up the game and controller at that price. 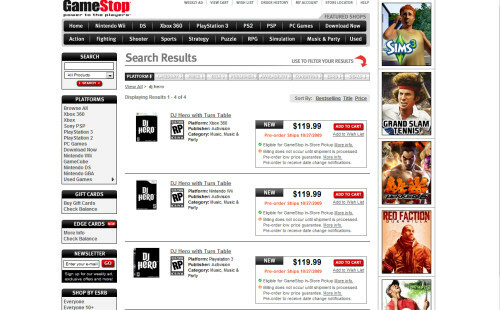 Currently, DJ Hero is listed for a October 27th release date on the 360, PS3, Wii and PS2. Page created in 0.5579 seconds.